One day after telling Illinois citizens "I need you to send a message to folks in Washington: stop drawing lines in the sand," Barack Obama is heading to the beaches of Martha's Vineyard to draw lines in the sand. Facing harsh criticism of the president's 10-day vacation in the midst of staggering unemployment, stock market panic, and several wars, Whitehouse spokesman Jay Carney told the quickly-scribbling press corps that "there is no such thing as a presidential vacation," before adding "and there's no such thing as golf," then closed with "and I'm not really even here." 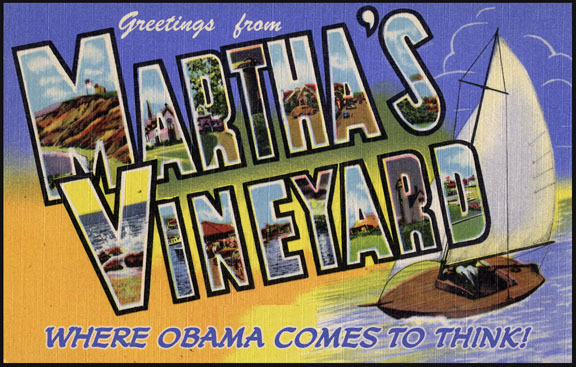 While in Martha's Vineyard, the president will rest up from attacking millionaires and billionaires by mingling with vacationing millionaires and billionaires, in much the same way that Jesus used to hang out with sinners. He will also walk on water if his busy schedule allows. But that may not be possible; along with all of the lighthouse tours, golf, ice cream, golf, bike rides, golf, miniature golf, and golf, the president has got to nail down the Super Secret Jobs Plan which he has announced he will reveal in September if his scriptwriters can think of anything by then. So have a great non-vacation, Mr. Obama, and from all of us here at Hope n' Change Cartoons... don't hurry back! Pretty good trick, huh? Almost as good as Barack Obama's masterful feat of magic when, according to his whistlestop campaign speech, he successfully "reversed the recession, avoided a depression, and got the economy moving again." But...we all blinked and missed it. Actually, Obama claims that we failed to notice his economic miracle because those darn Japanese had a huge earthquake, tsunami, and nuclear meltdown which somehow caused our unemployment numbers to rise here. And the "Arab Spring," which he'd previously praised, somehow had a negative impact on consumer confidence...perhaps owing to the president starting a new war in Libya and refusing to either talk about it or seek funding for it. And then Obama's booming economy moved in the wrong direction yet again because of the European Debt Crisis - the one in which nations are failing because they currently have the huge, unfunded entitlement programs that Obama wants more of. The president calls all of this "bad luck," but also blames the failure of his "now you see it, now you don't" fiscal boom on "partisan brinksmanship," which apparently traveled back in time to do damage to the economy before the actual negotiations took place. Talk about magic! And Barack "Houdini" Obama has one more trick up his sleeve. As he continues making campaign speeches from his "Magic Bus," the president has said that in September he's going to announce a jobs plan that will create another economic miracle...unless the Republicans fail to pass it, in which case the economy will be their fault from now on. Frankly, it sounds to Hope n' Change like the president is just trying to pull a rabbit out of a hat. Only it ain't no rabbit. And he's not pulling it out of his hat. Today, Barack Obama kicks off his 3-day "Listening Tour" of the Midwest, apparently laboring under the misconception that the hayseeds in flyover country can't send him messages by mail, telephone, the Internet, Twitter, or their elected representatives in Washington. Whitehouse staffers have declared that the president's bus tour is entirely non-political and unrelated to his re-election campaign, which is their way of saying that taxpayers will be picking up all the expenses, and putting thousands of dollars into the pockets of evil corporate bus owners. But at least traveling by bus and offering to listen to banjo-picking Deliverance extras shows a little newfound humility on the president's part - right? Because at yet another huge liberal fundraiser in New York (where he sneered about the people who live "West of here"), Barack Obama actually likened himself to Martin Luther King, Jr, saying that the civil rights leader was also vilified, controversial, and even despairing at times. But it's all okay, because what the president claims to have learned from Dr. King (perhaps after ingesting some unusual combination of pharmaceuticals) is that "the arc of the moral universe is long but it bends towards justice. But it doesn't bend on its own. It bends because all of us are putting our hand on the arc and we are bending it in that direction...and America's arc is going to be bending in the direction of justice and prosperity and opportunity." 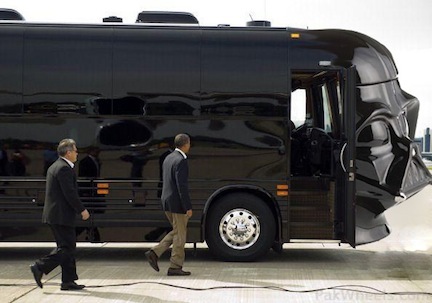 Which makes Hope n' Change think that maybe the president's tour bus should be christened "Obama's Arc," which only the president's wealthiest donors can board, two by two. While the rest of us are left to drown in his debt...and his BS. Obama prepares to spread his "I Had A Dream" speech from "Darth One."